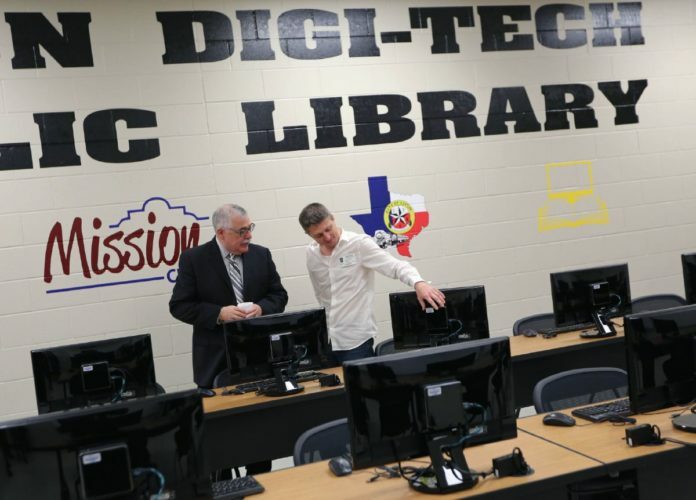 Steven Koepke, right, shows Alton City Manager Jorge Arcaute the equipment inside the Alton Digi-Tech Pubic Library during its opening Tuesday, Jan. 23, 2018 at Mission Collegiate High School in Alton. The digital and traditional library will be open after school hours for all members of the community. ALTON — Public libraries have long served communities with spaces to read, research and attend events of both a festive and educational capacity, and residents here now have a space to do just that. The city of Alton will finally have its first library space though a partnership with the Mission school district, which held a grand opening ceremony Tuesday together with the Alton Development Corporation. The event celebrated the opening of the first public library in the city, which is located at Mission Collegiate High School. The campus has extended its hours to accommodate the public and began welcoming area residents as of Tuesday evening. The library will be open to the public from 5 to 8 p.m. Monday through Friday, and from 9 a.m. to 1 p.m. Saturdays. The library also provides a computer room equipped with 24 computers and access to digital books on site or on the go. For this, the district extended its partnership with the online platform myOn, used by the district to offer thousands of free digital reading materials to students and any area resident interested. The city had been looking for ways to open a library for the past nine years, and about four years ago they started looking for ways to finance it through grants. The problem with grants was that most of the applications asked for usage data, which the city didn’t have considering there was not an existing library, he said. So they began looking into a partnership opportunity. At the time the idea was to retrofit an existing 25,000-square-foot warehouse located right in front of City Hall, Peña said, to include a regional training center and a bigger digital space, but then the idea of a pilot library was born. “It ended up that (the school district) said, ‘We have this room over here, maybe we can do a pilot program, get some of that usage data and maybe you can redo those grants and then maybe you’ll get the funding,’” he said. The school district offered the existing library at Mission Collegiate where additional amenities, such as the computer room, could be created and hours expanded to act as a public library. The city agreed to pay an estimated $443,093 for computer equipment, the myOn subscription and staff wages for the next two years through an interlocal agreement. The data collected through the pilot will not only serve for grants, but as a way to listen to the public and figure out ways to continuously adjust to the needs and demand from new to old technology.